Today we review the Simply White Shaker from Kitchen Cabinet Kings, manufactured by Innovation Cabinetry. This will be our first unit from Innovation Cabinetry, which was founded in 2005 out of Clearwater, FL. Their website describes the company as a family owned operation seeking to raise the bar of affordable, creative, and quality cabinet products. We ordered this unit with the other three KCK B15 white shakers right at a week ago, so the 5-7 business day estimate for delivery stays true to what is advertised on the website. Immediately we notice this unit is unique in the method used to build the door. 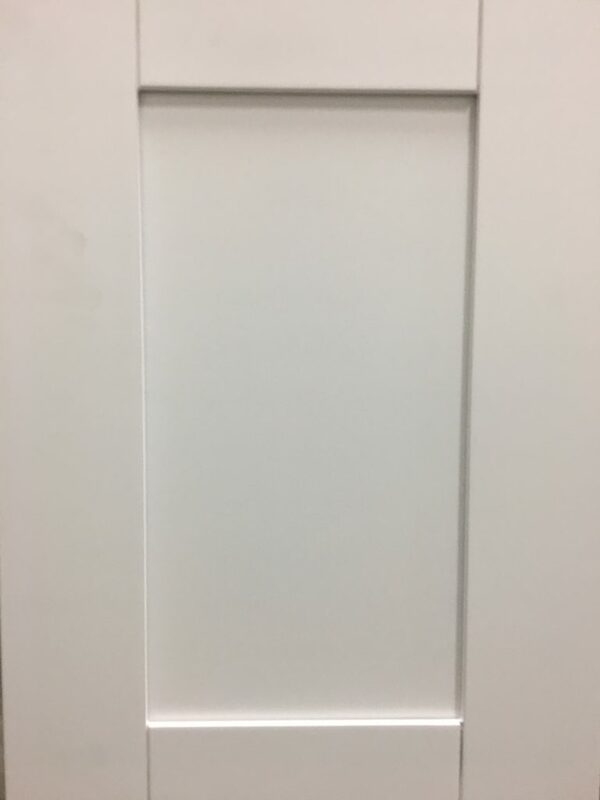 Rather than the five-piece cope-and-stick doors we have seen utilized with other white shakers, the Simply White implements a solid beech door frame with an MDF center panel (Picture 1). This method prevents cracks in the paint where the stile meets the rail in addition to creating a door that is solid, sturdy, and whole. The MDF center panel is a composite wood that resists warping due to humidity. With the drawer face, we see this same build replicated, and the cabinet frame is beech wood as well. 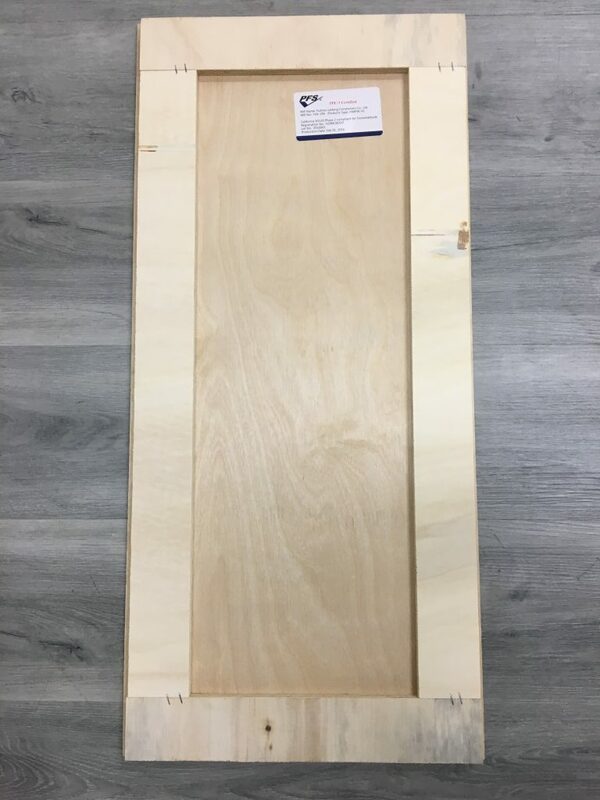 This beech wood door has one of the nicest finishes we have reviewed on our website here. With no visible indiscretions, the door of the Simply White Shaker boasts a thick, smooth finish that is evenly applied across all surfaces both on the front and back sides. Worthy of note is the vertical grooves that have been routed out separating the stiles and rails (Picture 2). This stylistic choice effectively creates the appearance of a five-piece door while still maintaining the unity of the door as a single piece. Most impressive is the even application of the paint finish in these routed grooves as well as on the Medium-density fibreboard center panel. Seen above, the painted finish of the interior of the unit is found on the exterior of the side panels as well. Most unique concerning the finish of the box is that the tops and fronts of the side panels are painted with a thick coat to create a slick, sharp aesthetic to the cabinet face. The reason this is so impressive is that the panels are composed of plywood, so to accomplish this even coat takes diligence, time, and skill. As can be seen even better in these close-ups of the side panels, the impressively painted side panels and back panel all measure 3/4 inches in thickness. The manufacturer even went so far as to cover the finished tops and sides of the panels with a protective plastic layer that can be peeled away during assembly (Pictures 4). The finish is so thick and smooth that it is not visible to sight or touch that these panels are plywood, and they are so heavy one might even assume they are solid beech wood just like the cabinet face! Where we see this unit to start losing its allure, however, is in the box. The picture-frame recess back panel fits into the side panels and bottom panel by means of wooden pegs (Picture 5). 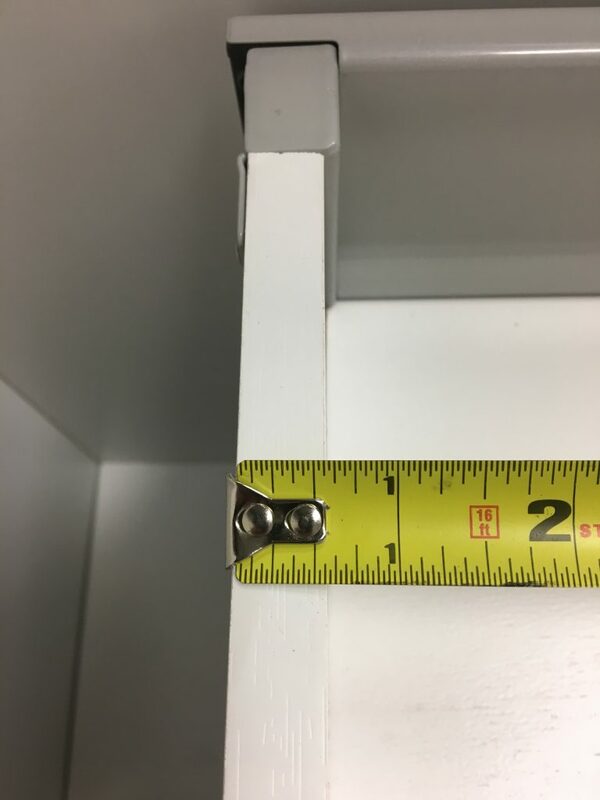 These pegs precariously hold the unit together while the builder is supposed to tack finish nails through the side panels all around in order to keep the unit from falling to pieces. 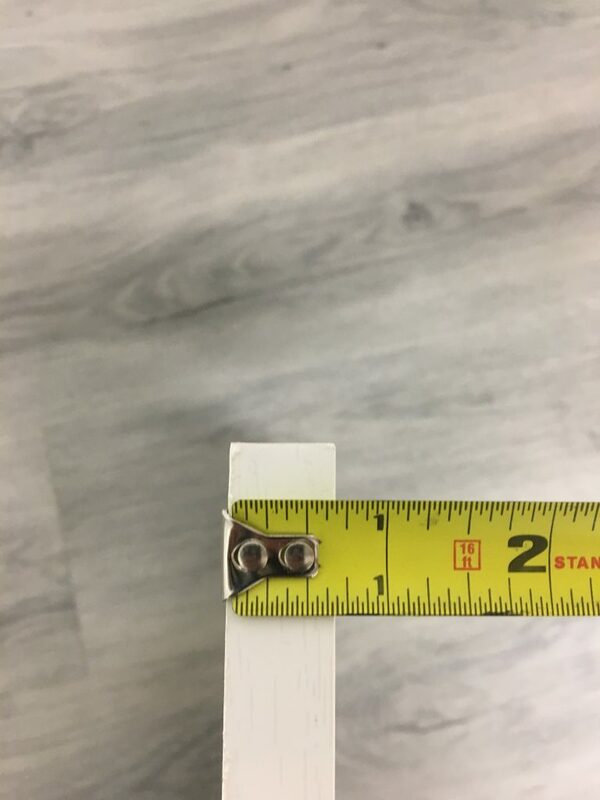 This is a major negative feature in our scorecard, as the quality of the unit comes seriously into question when assembling the box without ANY cam locks, brackets, or cleats provided by the manufacturer. 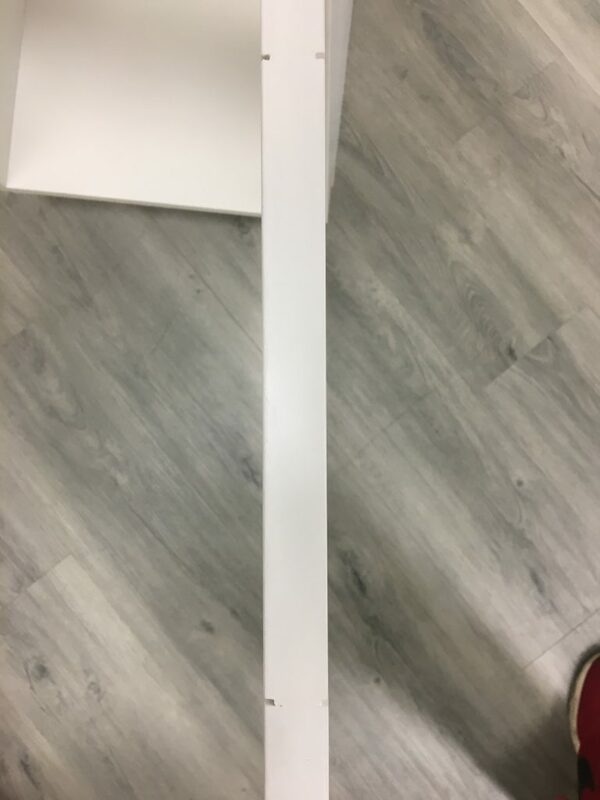 On top of this, there is no toe kick so even after tacking all of the panels together (provided you have finish nails and an air-compressed powered nail gun) the Simply White is unstable and extremely wobbly with the weight of all the panels leaning against one another. between the metal side panels (Picture 8). At the slab-style face of the drawer box, metal pegs click into place (Pictures 9). 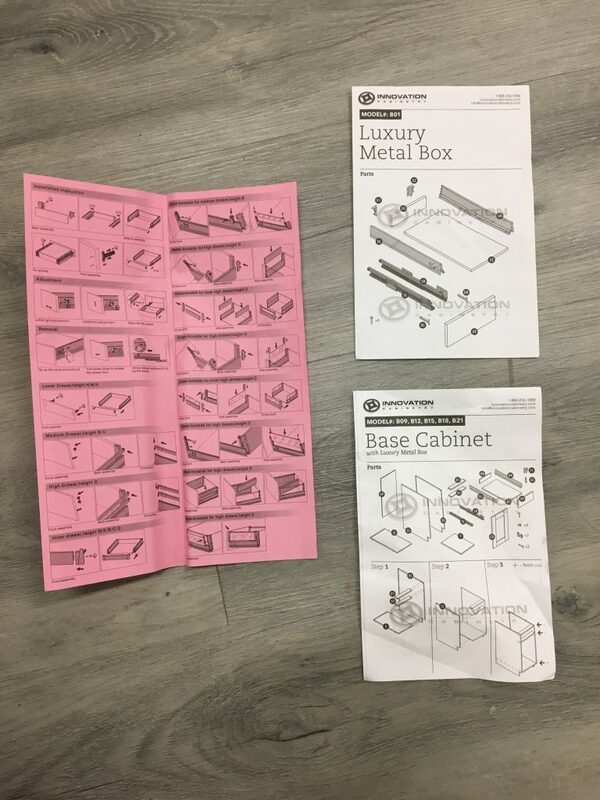 While it is undoubtedly a unique box, it can be veritably frustrating to put together: the back panel is an awkward size to hold steady in the correct position to correctly attach the aluminum brackets. When it is all said and done, the box has a futuristic aesthetic but is not as sturdy as, say, the drawer box made by Forevermark (Picture 11). We’ll continue to discuss the drawer box, but shift focus to the storage capabilities it presents. 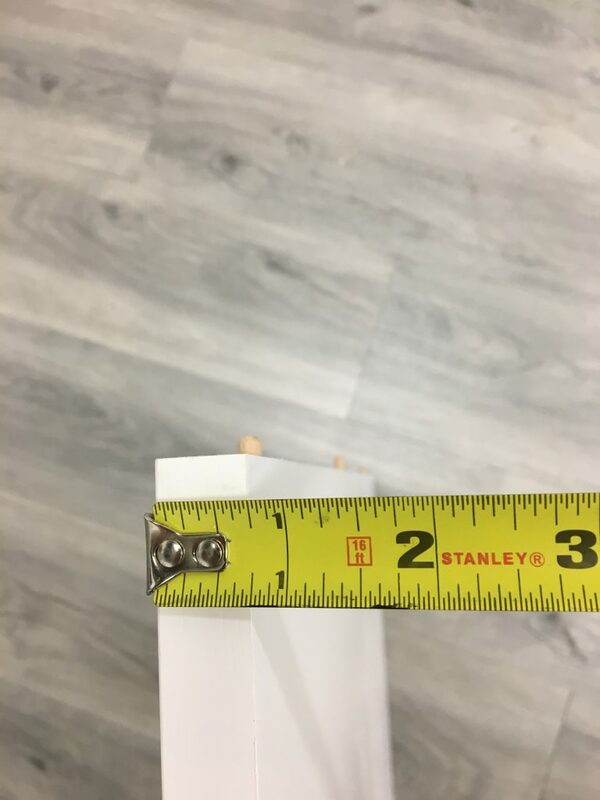 Measuring 3 inches deep and 10.5 inches wide, the drawer box of the Simply White Shaker exhibits an industry standard depth with a width excelling over the other boxes we have reviewed (Pictures 12 and 13). 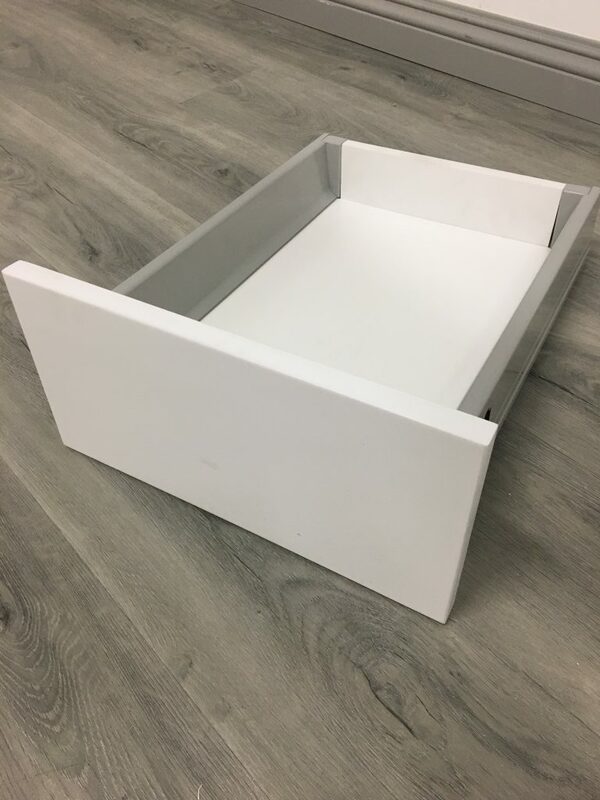 The majority of drawer boxes possess an interior width of 9.5 inches, which effectively functions in holding items in your kitchen or bathroom. We are highly impressed to see a drawer box utilizing the available space in the box of the unit. 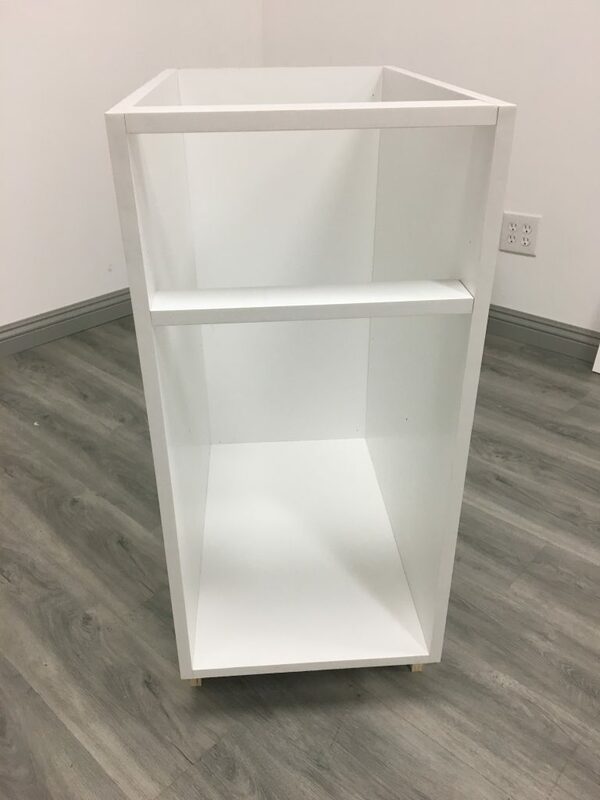 The purpose of a cabinet is to store items so when we see a unit engineered to save money for the manufacturer rather than provide the customer with a quality storage device we slightly hang our heads with disappointment. There is a major drawback with this drawer box, and that is the amount of empty space between the back panel of the drawer and the back panel of the cabinet box. 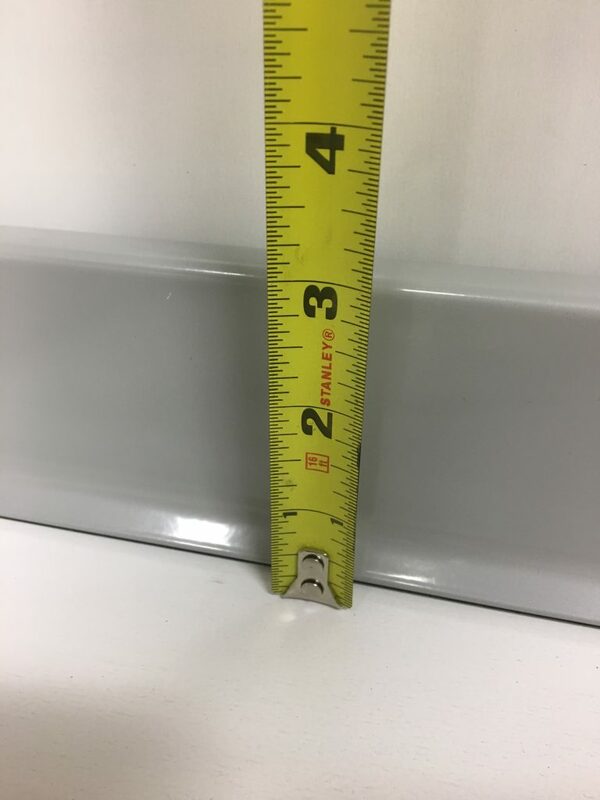 With just shy of 6 inches hanging devoid of shelf or drawer, the extra width presented by the drawer box is crippled by the lack of length, which is 3 inches shorter than the average box (Picture 14). 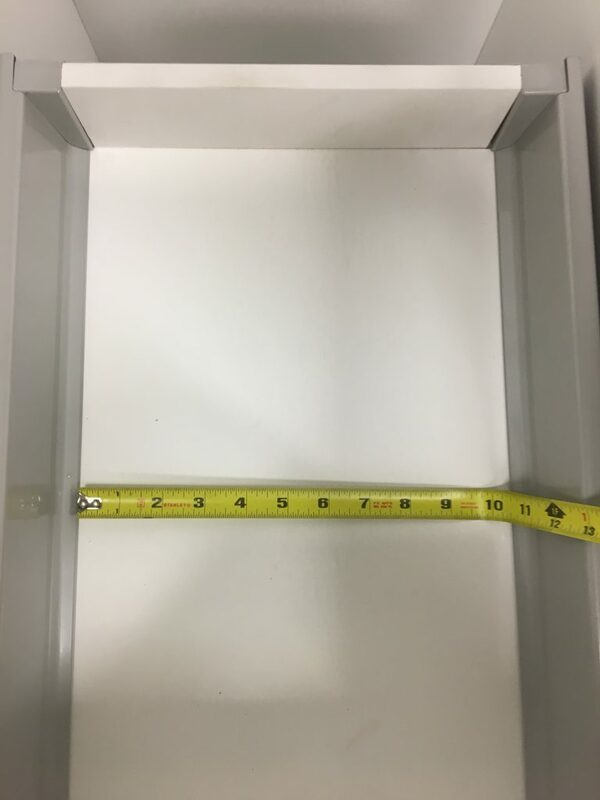 It’s a toss-up between width and length with this box, but this is unquestionably a unique utilization of storage space in a drawer box. On a positive note, however, is the fact that this box features a full-extension drawer (Picture 15). Another impressive storage feature of the Simply White Shaker is the floating interior shelf. Measuring just shy of 3/4 of an inch in width, the shelf is finished on all 6 sides (Picture 16). 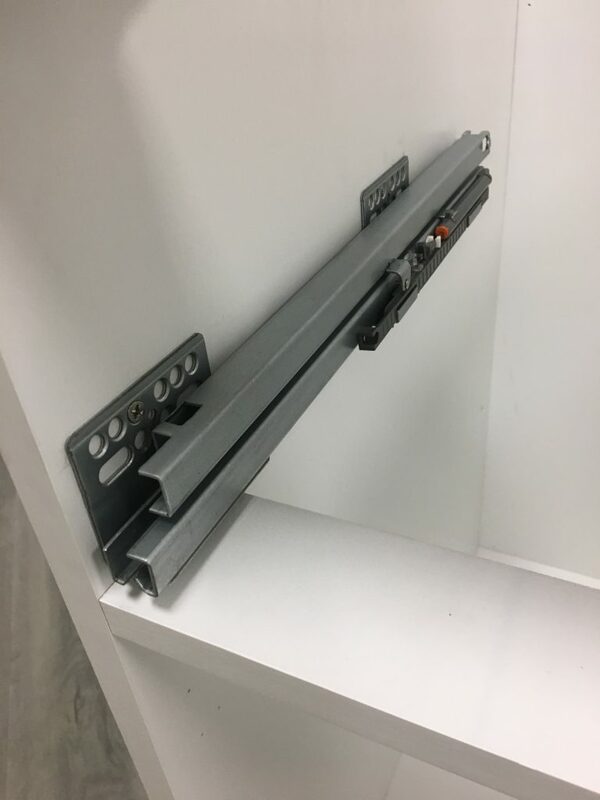 This is something we have never seen with a shelf; it allows for the shelf to not only be flipped but reversed in direction to keep the surface from being marred in any one direction beyond repair. Longer than the typical shelf in B15 shaker units is the 16-inch long shelf of the Simply Shaker. 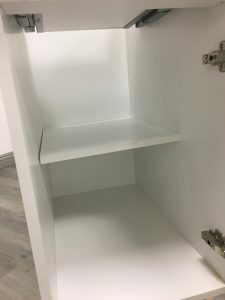 While there is still some void space toward the front of the unit, the shelf maximizes storage capacity in the box in comparison to the floating half shelves in past units we have assembled. 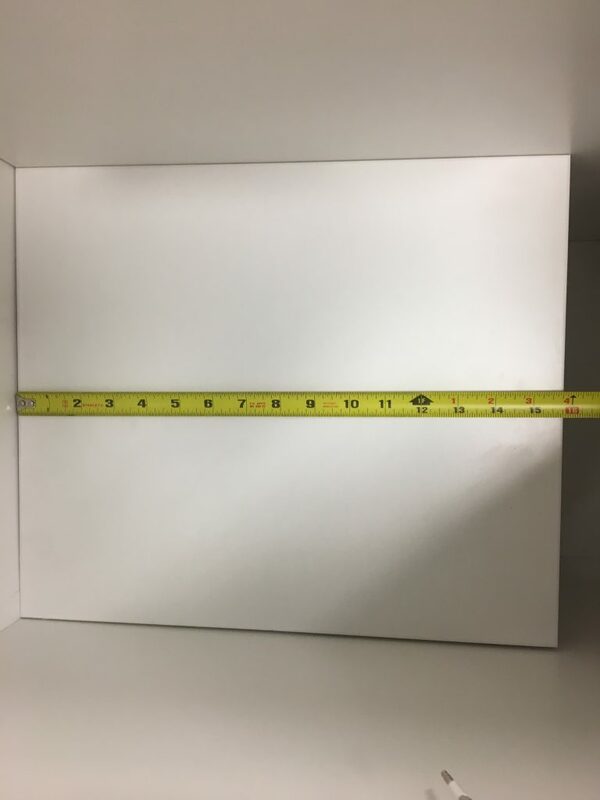 One final and important note to be made regarding the storage capabilities of the Simply White is the frameless nature of the box. (also know as “flush-frame). 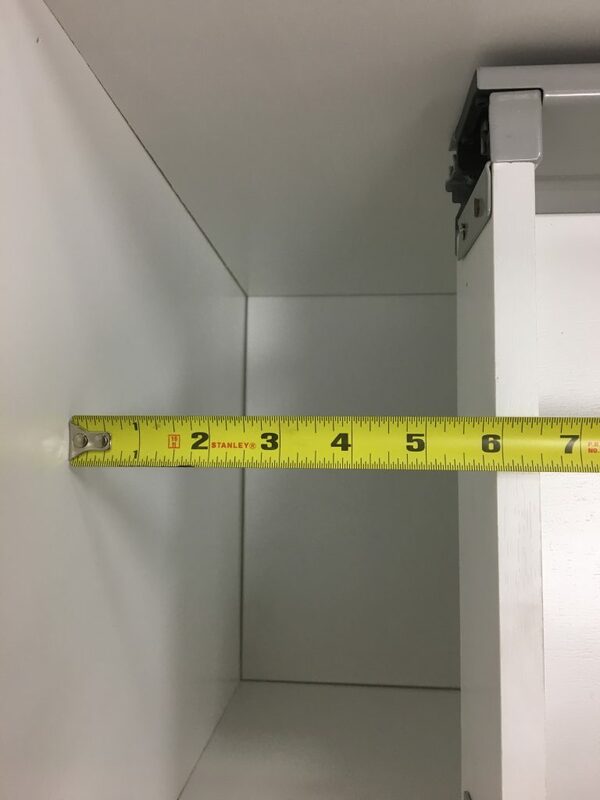 This characteristic is typically seen in European style cabinets and the goal is to create easier access to storing and removing larger items within the unit. 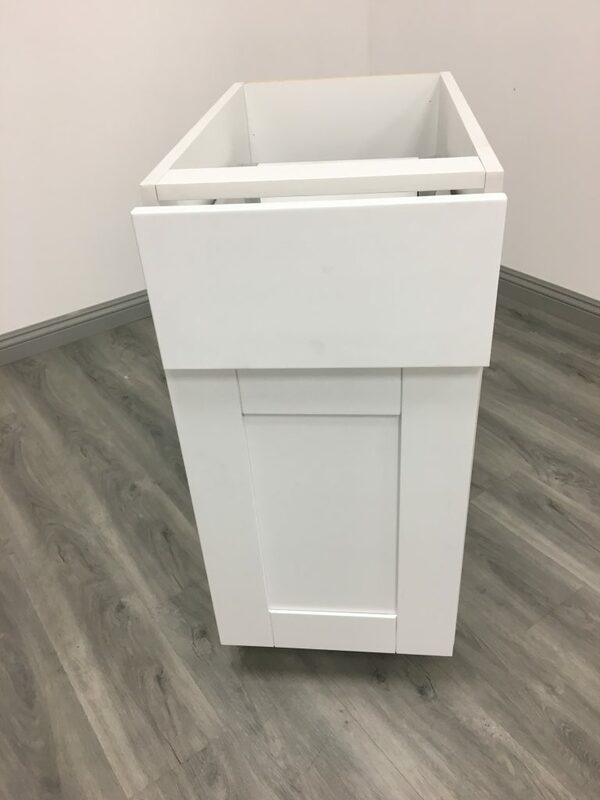 It is very rare to find a white shaker with this feature, so the fact that the Simply White offers it is quite impressive in our books and definitely lets us know how “Innovation” looks to live up to the standard set by their name. The Hinges of the Simply White are UCD brand soft close mechanisms that require mounting on the part of the builder (Picture 19). 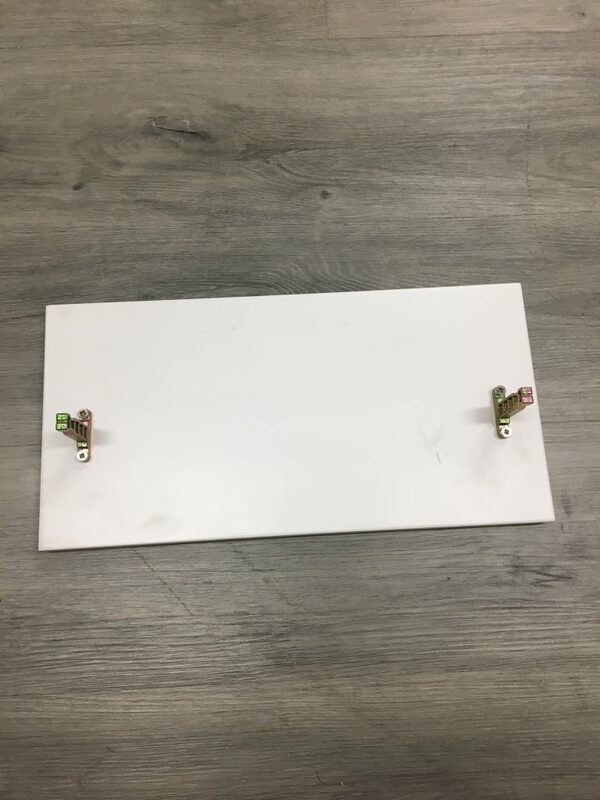 Many units come with the hinges already pre-fixed to the door borings as well as to the frame of the unit, but since this is a frameless cabinet the hinges require separate assembly (Picture 20). UCD brand is a high-mid quality brand of hardware, just below the BLUM grade that sets the bar for these products. 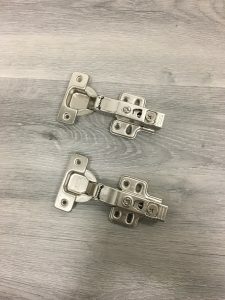 We see a set of drawer slides very different from other cabinet units we have reviewed on our site with the Simply White. The slides mount to the front of the unit to the side panels through wood screws into pilot holes (Picture 21). They do not rest on the crossbeam underneath the slide, so the weight of the drawer box and items contained within it are supported fully by the four wood screws holding up both of the slides (2 wood screws per slide on either side). 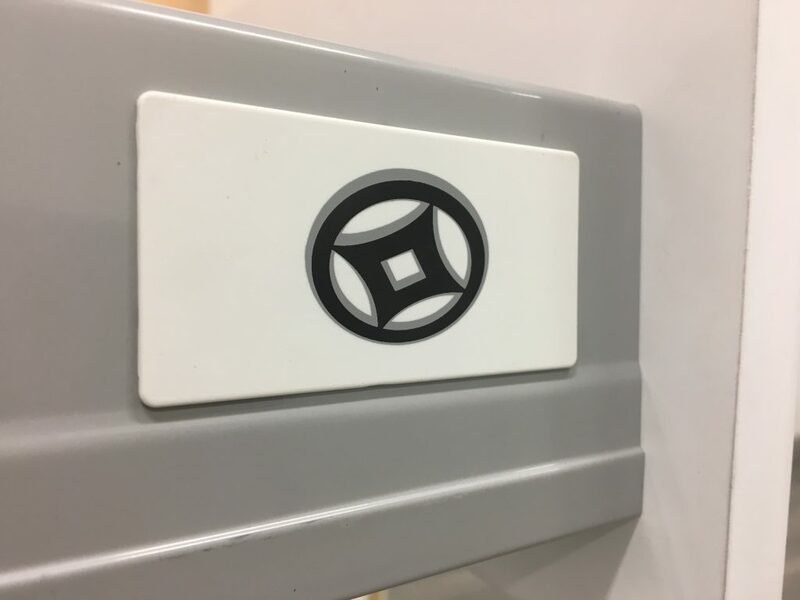 The glides for the slides are built into the side panels of the drawer box and clip into place with ease. 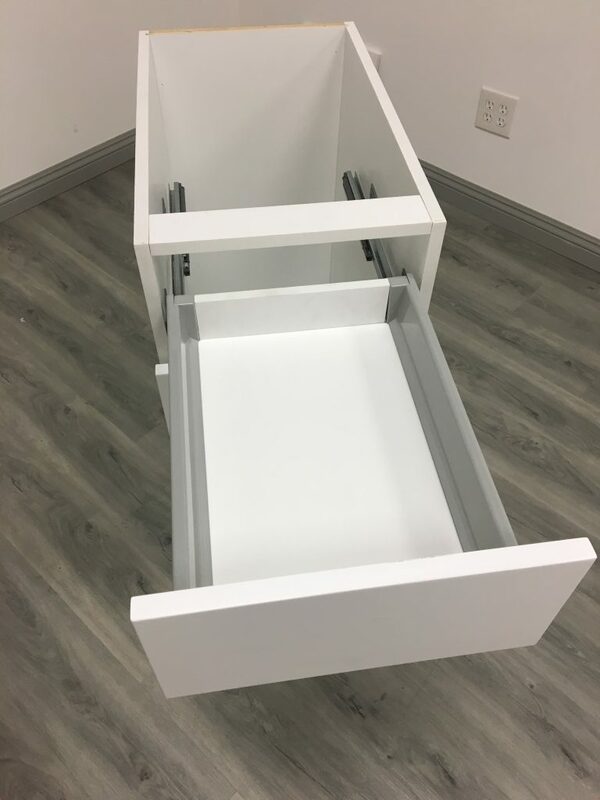 With soft-close capabilities, the side-mount drawer slides of the Simply White Shaker are quality, unique, industry standard mechanisms. This is by far the most disappointing area regarding the Simply White Shaker. 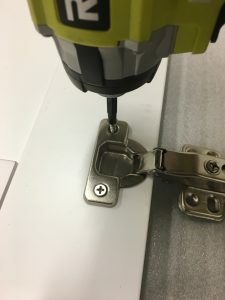 There are virtually zero connecting parts or hardware provided with the unit beyond the wood screws provided to mount the hinges to the door and frame (Picture 22). 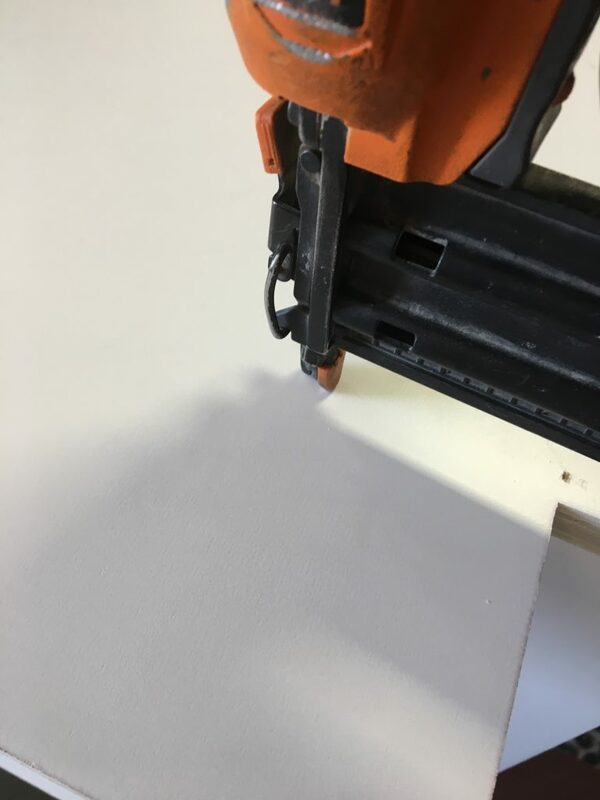 A nail gun with an air compressor or Pneumatic staple gun are required in order to “properly” join the side, back, and bottom panels as well as the cross beams which frame the slab-style drawer face. Unless you are a handyman (or woman) and have these tools at hand, this process will not be possible until you rent the necessary tools from your local hardware store outlet. 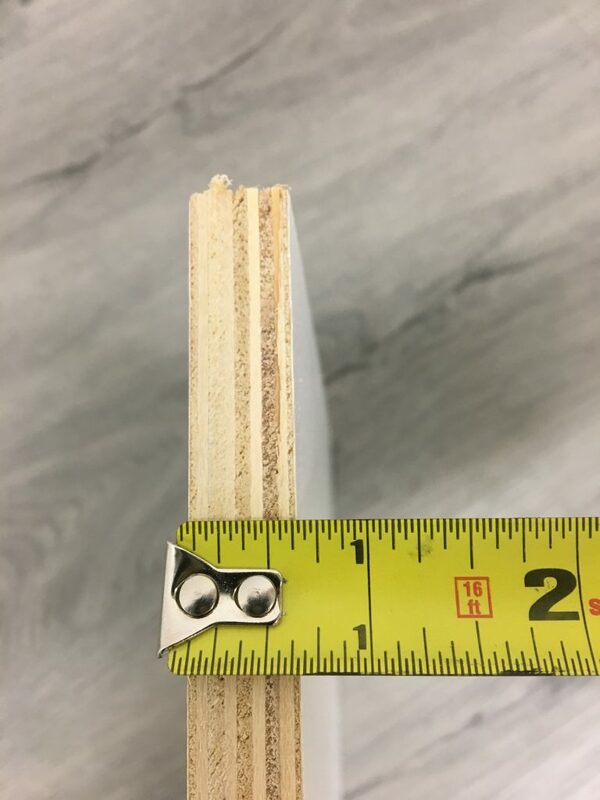 Without the finish nails or staples, there is literally nothing holding the Simply Shaker together save for tiny wooden pegs that fall out of place with the slightest movement. 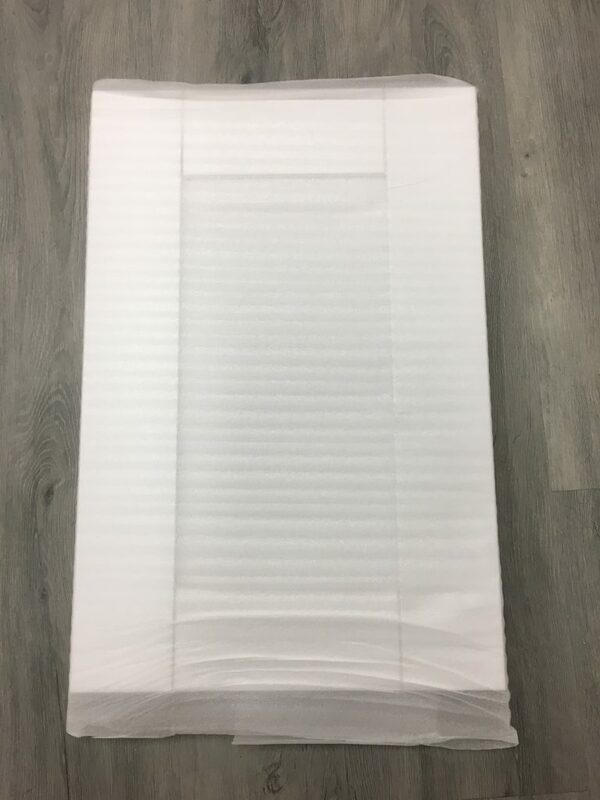 Double corrugated cardboard surrounds the contents of the package, with the pieces of the unit being neatly arranged and organized inside to prevent any items from bouncing around and scraping against each other during shipment (Picture 23). In each of the four corners can be found a thick strip of styrofoam, which is not something we have seen before with a pack-job (Picture 24). 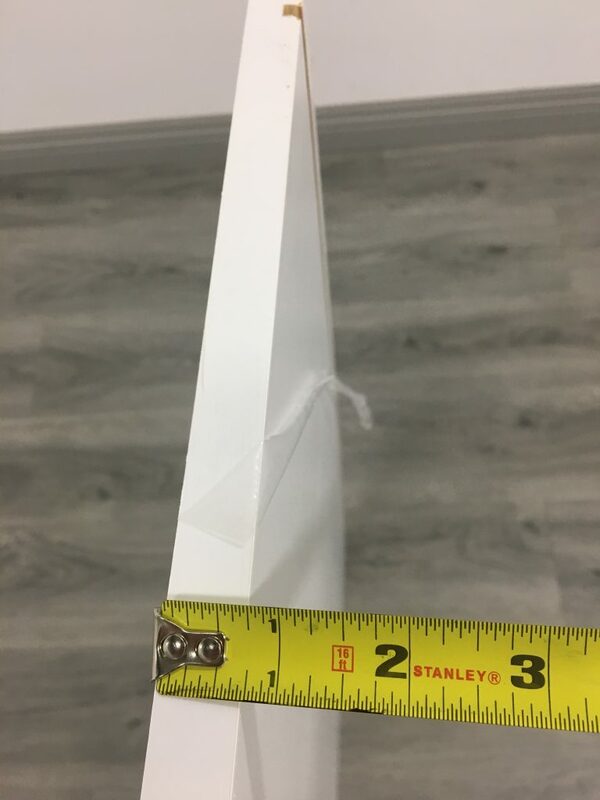 Usually, four hard cardboard corner pieces are placed to protect the unit, but we have noticed these are not as effective as the manufacturer might hope for them to be. 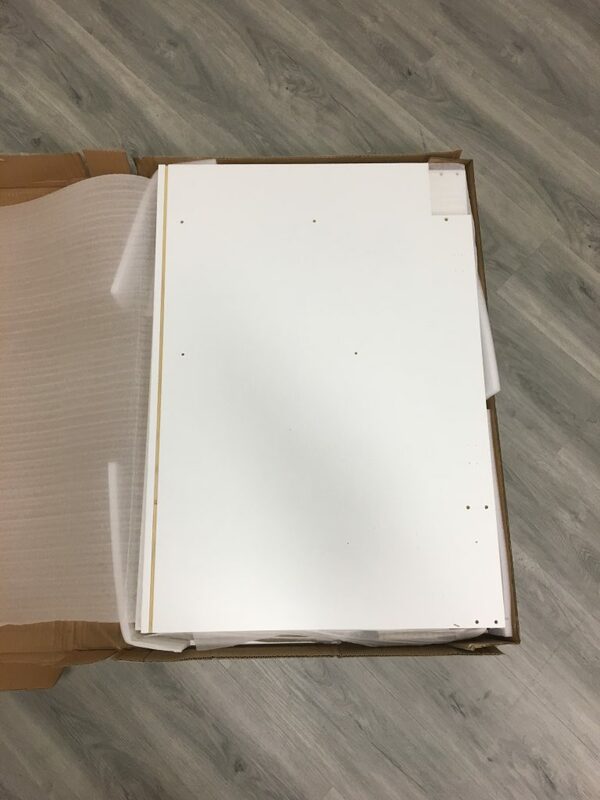 The use of these thick styrofoam sheets illustrates the value Innovation places on making sure the cabinet arrives at its destination without incurring detrimental damage. 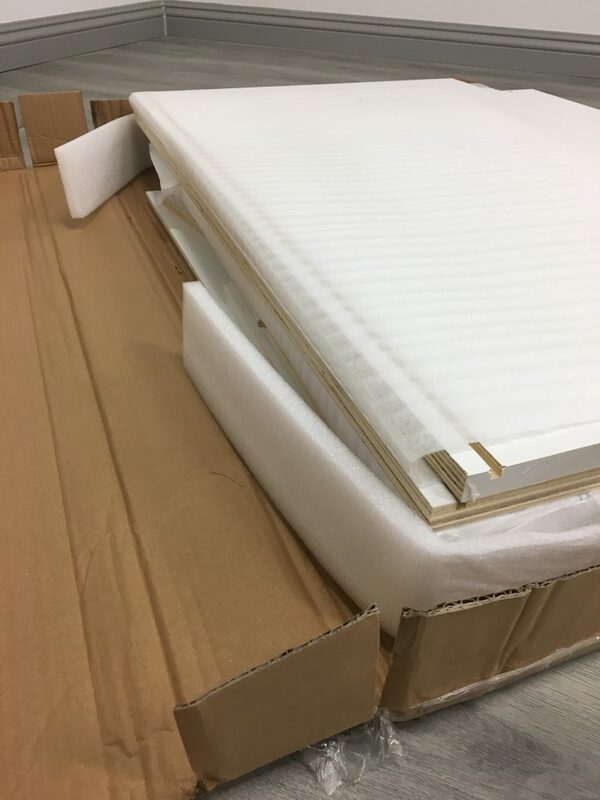 neatly packaged in cardboard boxes, which makes them easy to keep track of during the assembly process and well-protected from the various panels organized alongside one another (Picture 26). The parcel as a whole is fairly easy to handle and unpackage, making the overall pack job a satisfactory grade. This assembly process has proven to be the most frustrating of any cabinet we have yet put together and reviewed here at RTA Cabinet Reviews. Provided, the instructions are extremely detailed and present a step-by-step guide to forming the structure of the unit, but for one person to hold the panels in place properly while attaching them to one another is very challenging (Picture 27). We would highly suggest having a second person present to complete the process. Additionally, finish nails or pneumatic staples are required to permanently hold the panels together (Picture 28). These elements combined with the weight of the high-quality wood used for the panels create a recipe of obstacles just to get the skeleton of the unit assembled, before even attempting to attach the door and drawer face to the box of the Simply White. The slab-style drawer face offers full overlay for the face of the cabinet. 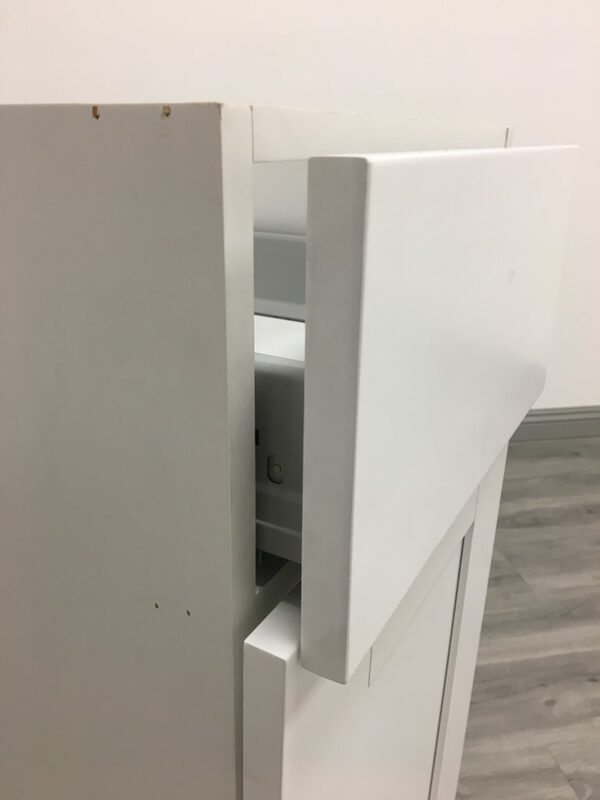 There are some minor adjustments that take a fair amount of time to complete before getting the door and drawer face to fit perfect. 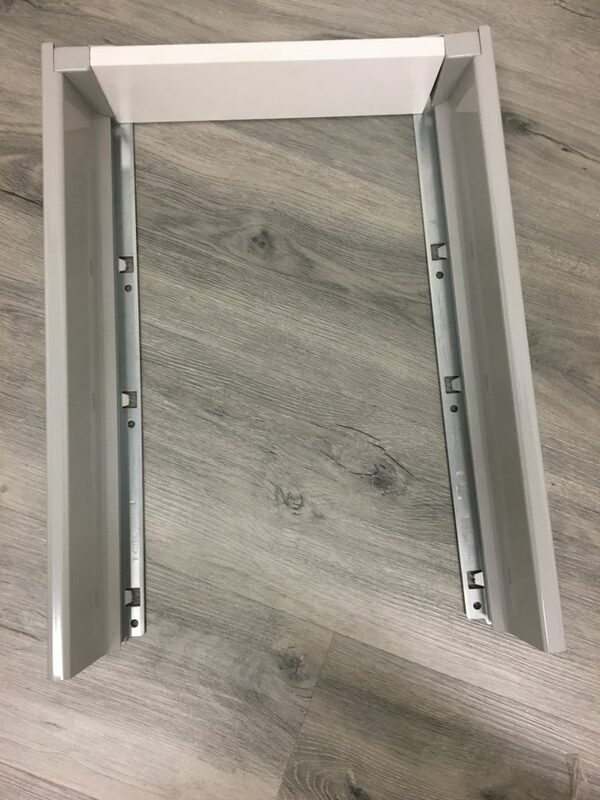 Be sure to mount the drawer slides as high as possible on both side panels; this will lift the drawer front and prevent it from catching on the cabinet door when opening and closing the drawer, as can be seen in Pictures 29 and 30. These minor adjustments, coupled with the tweaks made to the hinges of the door, are also very frustrating to get to fit in the correct alignment and end up occupying a significant amount of time. Kitchen Cabinet Kings offers a variety of ways to get ahold of their Support Team through their website. Their phone number is listed in bold at the top of each page you navigate through their user-friendly web layout, with the categories of their product clearly labeled under tabs and assorted by color, style, and price. They have been quick to answer my questions through their Live Chat services as well as immediate responses to my email queries. 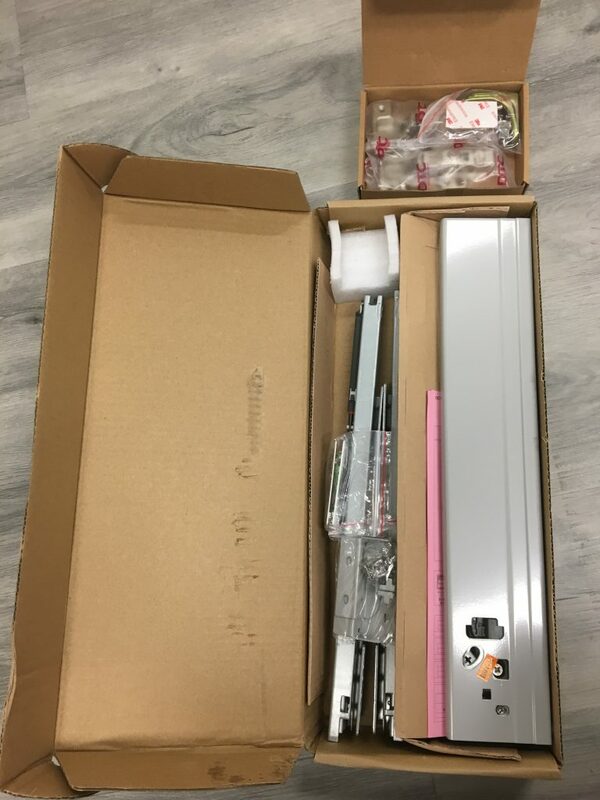 Although their Customer Service team is brisk, they are still knowledgeable and effective in assisting with the resolution of any issues one might come across when assembling a cabinet unit purchased from their inventory. If you decide the Simply White Shaker is your preferred unit, we highly suggest chatting with a member of their Support team through the Live Chat before pulling the trigger on purchasing a full kitchen of this white shaker model. 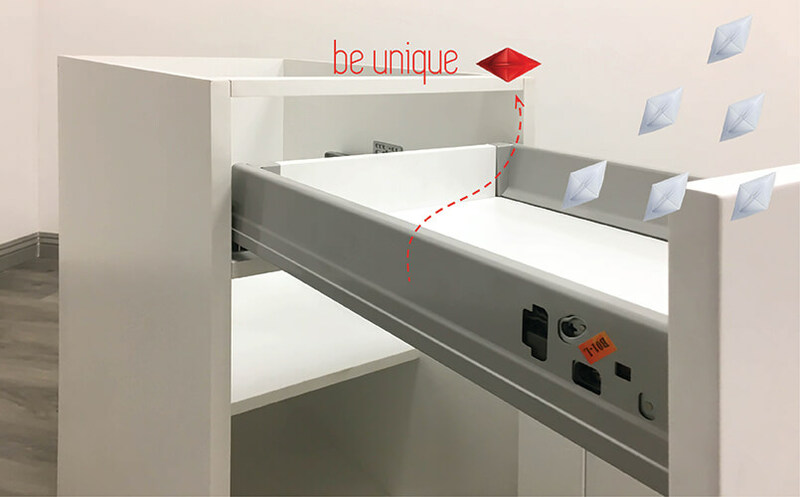 There are not many manufacturers bold enough to include a metal drawer box with their unit, much less to make it work efficiently. The Simply White Shaker is different, giving the impression that RTA cabinets may be making a shift in this direction as the engineering becomes more concise, easily understood, and affordable for manufacturers. 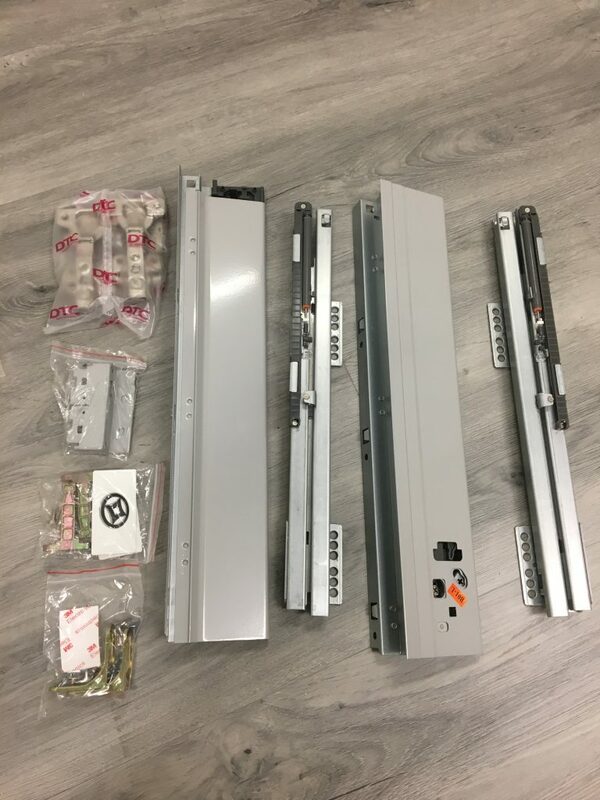 While this unit has it’s drawbacks, we recommend it to anyone with the budget, patience, and time it requires to assemble. It is a cabinet worthy of conversation, and one that has called for us to take another look at the future of Ready-to-assemble units.